Thanks for reading and forwarding this newsletter. Sign up. This week we begin in Michigan, the state shaped like a mitten, with the hub of the U.S auto industry located near the base of the thumb. The state’s two largest utilities would like to get into the auto business in a way — with plans for electric vehicle charging stations. 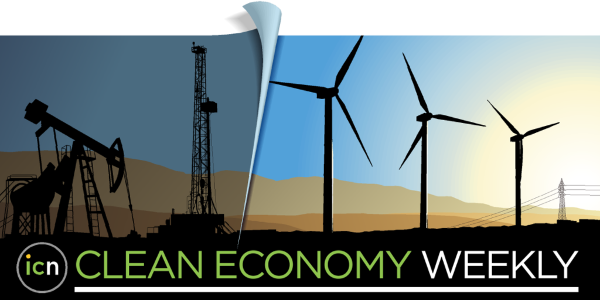 I’m Dan Gearino with news and analysis of the clean energy economy. Send comments and news tips to dan.gearino@insideclimatenews.org. Thanks for reading! 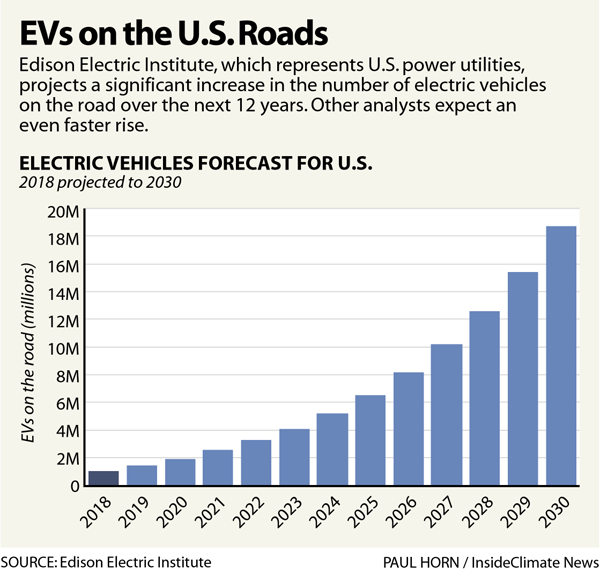 Utility companies are seeing opportunities to grow by getting into aspects of the electric vehicle business. My colleague James Bruggers wrote about this for ICN, focusing on Duke Energy’s announcement of a $76 million plan in North Carolina that's largely about developing charging stations. The story mentions that utilities in Michigan, the center of the U.S. auto industry, have similar programs. The Michigan utilities, like others across the country, can charge their entire customer base to pay for EV programs, subject to approval by regulators. This provides a source of financing that other EV infrastructure companies don’t have. The programs are designed to encourage people to buy EVs, which in turn leads to an increase in electricity sales. What is unique about Michigan is that major automakers are based there and are active in state regulatory issues in a way that they aren’t in most other places. Automakers could put up obstacles to impede the utilities’ EV plans, but so far, the opposite is true. 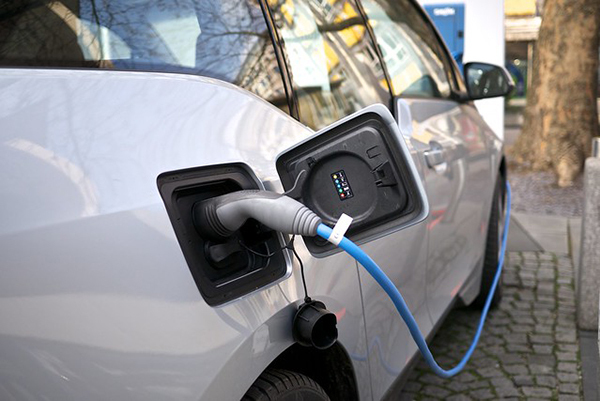 ● The Michigan Public Service Commission is in the final stages of reviewing an application from DTE, the state’s largest utility, to spend $13 million on rebates that would offset some of the costs of thousands of EV charging systems over three years. ● The state’s second-largest utility, Consumers Energy, is a few steps ahead, with a program approved by the commission in January. The $7.5 million plan includes rebates for charging systems and research into how the utility can better accommodate EVs. Charles Griffith, director of the climate and energy program for the Ecology Center in Ann Arbor, told me this is a very good start. His group regularly participates in environmental regulatory issues in the state, including these cases. The key element here: The utilities want to become experts in EVs, seeing the vehicles as a way to sell more electricity and to earn a profit from building and maintaining charging stations and other infrastructure. The automakers’ actions in the Michigan utility cases suggest they’re following through. This is important because there is a history of U.S. automakers talking about how EVs are their future, but at the same time doubling down on vehicle lineups dominated by trucks and SUVs that run on gasoline. Griffith says the next step is for these three-year programs to work so well that the utilities come back with proposals on a much larger scale. The DTE electric vehicle proposal is part of a larger rate plan that has a provision that environmental advocates strongly dislike: to increase the costs of rooftop solar. I wrote about this in October. The rooftop solar proposal would add a monthly fee for solar owners and reduce the rate that the owners are paid for excess electricity they sell back into the grid. The case has been thoroughly litigated since my story, and state regulators will likely issue a decision within the next month. Becky Stanfield, Midwest director for Vote Solar, told me she “would be shocked” if the fee gets approved. As for the rates for selling excess solar power, she thinks the case record indicates that the ruling will be somewhere between the big rate cut proposed by DTE and the much smaller cut that many other parties are suggesting. I bring up the solar provisions because they show the odd interplay between environmental groups and DTE in this process, and in many large rate cases that come before state regulators. The sides were allies on the EV plan and fierce opponents on the solar plan. Utilities in many states are pushing for policies that would reduce the financial benefits of owning rooftop solar, including in places where the solar market is still small. That’s the story in Iowa, where lawmakers are considering a bill that rooftop solar companies say would be devastating to their businesses. The bill, strongly backed by the state’s largest utility — MidAmerican Energy, owned by Warren Buffett's Berkshire Hathaway — would allow utilities to impose a fee on rooftop solar owners. The fee, estimated at about $27 per month, along with an already-in-progress phase-out of federal and state tax credits, would make solar much more expensive for consumers. For now, it looks like Iowa House Republican leaders don’t have enough votes to pass the bill, which is likely why the measure didn’t come to the floor for debate this week. A solar advocate told me that means “we live to fight another day.” Their hope is to make it to mid-May, when Iowa’s legislative session is scheduled to end, with no vote on the measure. 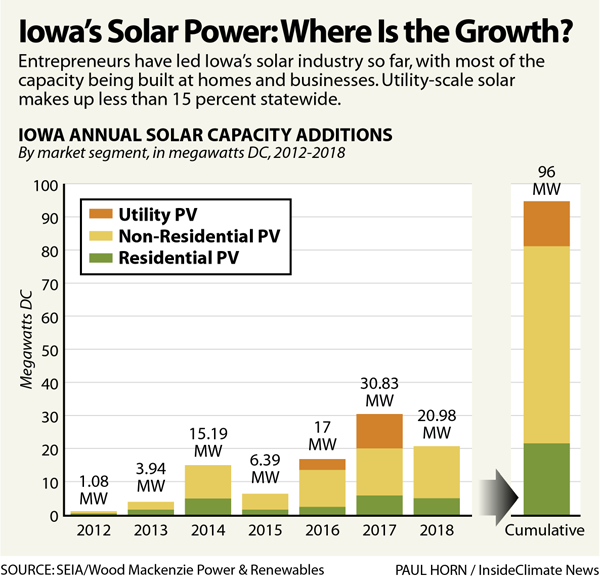 I wrote this week about one of the small businesses that helped to build Iowa’s solar industry, Ideal Energy in Fairfield. The story, which I had in the works before the legislative proposal was introduced, shows how entrepreneurs built an industry in the state almost from scratch. 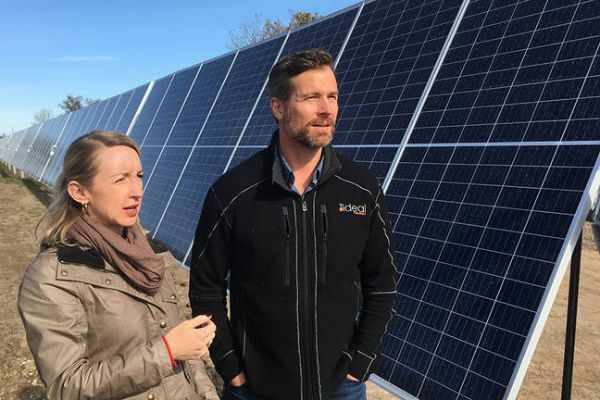 Ideal Energy’s co-owners, Troy and Amy Van Beek, have fascinating personal stories and have overcome many challenges to build their company. The current debate is another one of those big challenges, and I’ll be watching to see how this chapter of the story ends. 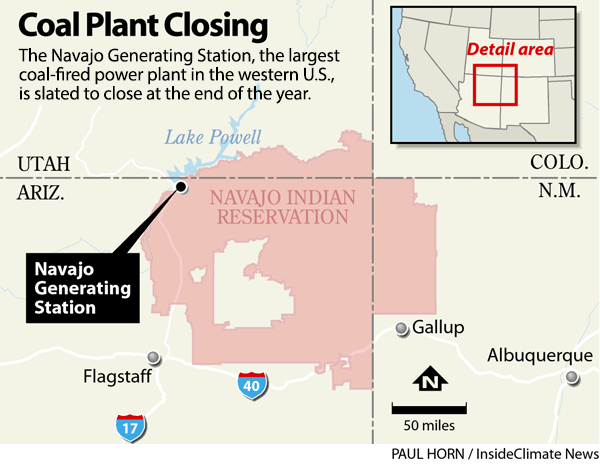 The likely closing of the Navajo Generating Station in Arizona, the largest coal-fired power plant in the western U.S., is leading to big questions about the economic future of the Navajo Nation, which has long depended on the plant for jobs. Two recent stories look at the potential for renewable energy jobs to fill some of the void. The utilities that co-own the plant decided in 2017 that they would shut it down because the costs of generating power there were no longer competitive with other options. Leaders of the Navajo Nation explored buying the plant to keep it open but ruled out those plans last month. National Public Radio also had a report about the power plant and the push to shift to renewables. There is potential to build wind and solar to replace some of the electricity capacity and jobs that are going away. But this is far from a one-to-one tradeoff. Solar and wind development means lots of construction jobs, but few permanent jobs. At the same time, if the Navajo Nation can build businesses tied to solar and wind, that could lead to something more enduring. That’s not simple and will not happen quickly, but there are members of the Navajo Nation who are trying to do it. The NPR and E&E stories both have interviews with Brett Isaac, a co-founder of Navajo Power, a start-up that wants to lead the way on solar development. Solar power “takes the benefit of something that's abundant and converts it into something usable," Isaac said in the NPR story. "So that aligns a lot not only with Navajo philosophy, but a lot of indigenous communities about how you responsibly source things." Puerto Rico Passes 100% Clean Energy Bill, But Will Natural Gas Imports Get in the Way? Copyright © 2019 InsideClimate News, All rights reserved.